Amelie's Blog : KOCOSTAR is now in Sephora! KOCOSTAR is now in Sephora! Just before April ends, I am here to share another great news with you guys! Yeah! KOCOSTAR is now available in Sephora Malaysia! If you have been a fans of Korea Beauty Trend, you should never missed out Kocostar, the No.1 creative and innovation mask brand in the world, which has over thousand stores at more than 20 countries worldwide. Kocostar creates quality masks that beyond your imagination because its mask range fully covers you from hair to toe! It definitely provides you a whole mask experience which is home based yet equally similar with the salon treatment. You can now indulge in Salon Beauty Treatment on your own, right at home now! The benefits aside, all the mask ranges come in gorgeous packaging, fully in colorful pastel and vintage design OMO, the watermark floral print and black vintage frames. All the icons on the mask pack served well in describing the usage and duration. Wait no further, lets get into the mask range one by one. 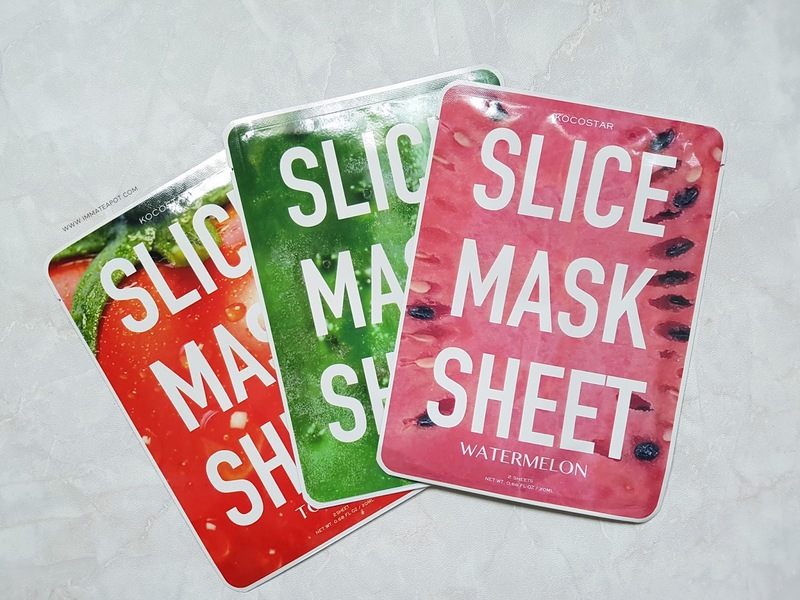 Kocostar Slice Mask Sheet, the most fresh mask sheet in fruits and vegetables sliced concept! It comes with 4 variants, which are the lemon (whitening & brightening), cucumber (moisturizing), watermelon (hydrating & refreshing) and tomato (radiance glow) slices that serves with difference benefits. Aren't they look exactly like the real fruits and vege slices? So fresh and yummy! 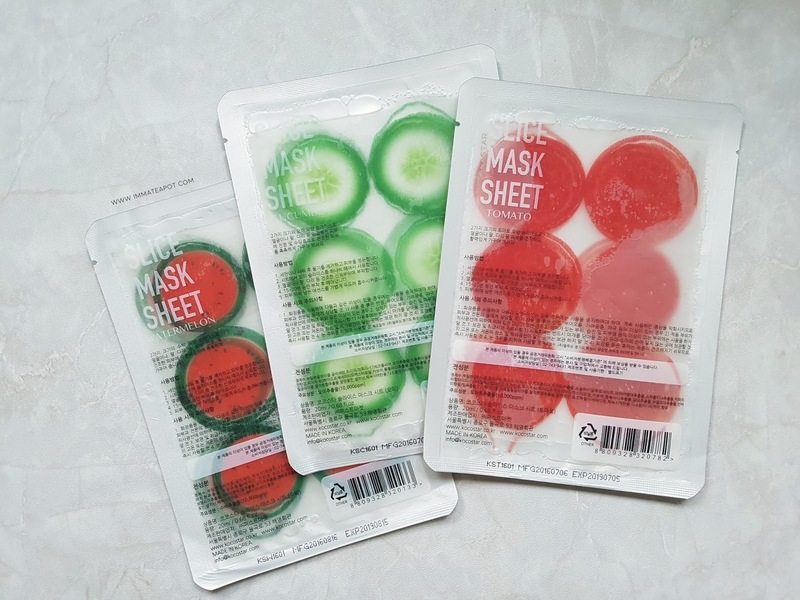 All the slice masks are actually cut in piece by piece in round shape which are definitely easy to use and you can apply anywhere you want, especially some unreachable body parts like elbow and ankles. 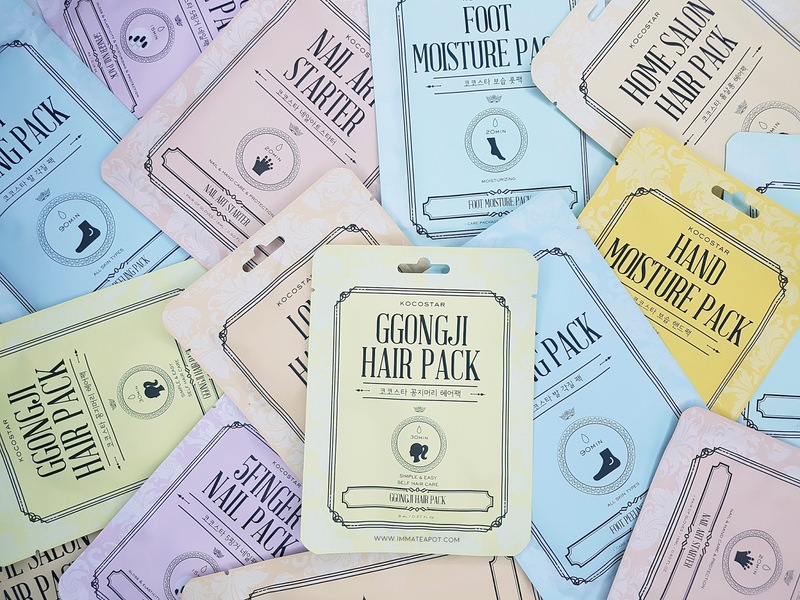 Ggongji Hair Pack: Contains of Argan Oil, Olive Oil and Shea Butter that helps soothing and nourishing the hair in a Ponytail way. Just wrap your ponytail in the mask cap will do. 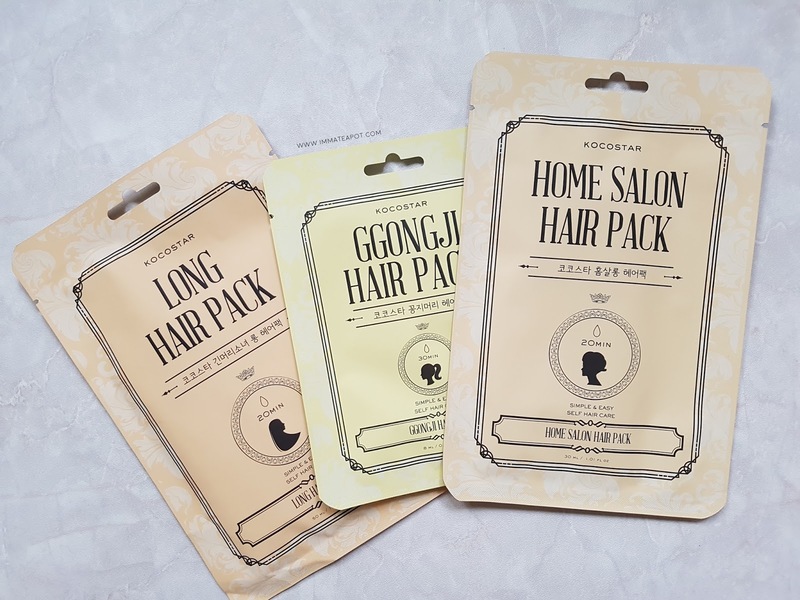 Home Salon Hair Pack: Hydrates and rejuvenates dry damaged hair, leaving the hair soft and silky. Long Hair Pack: Designed for long hair that serves the similar benefits as the salon hair pack. Hand Moisture Pack: Improves skin hydration and protect against dehydrated hands. 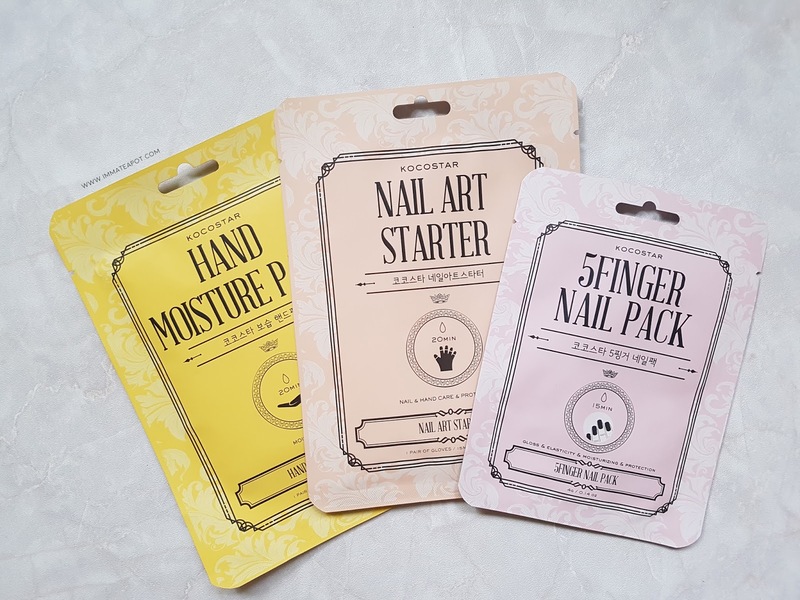 5Finger Nail Pack: Contains of botanical ingredients and vitamins that helps protect and repair stressed nails while strengthening them. Nail Art Starter: A hand glove that helps nourishes hand when using nail polish or UV lamps during nail care. 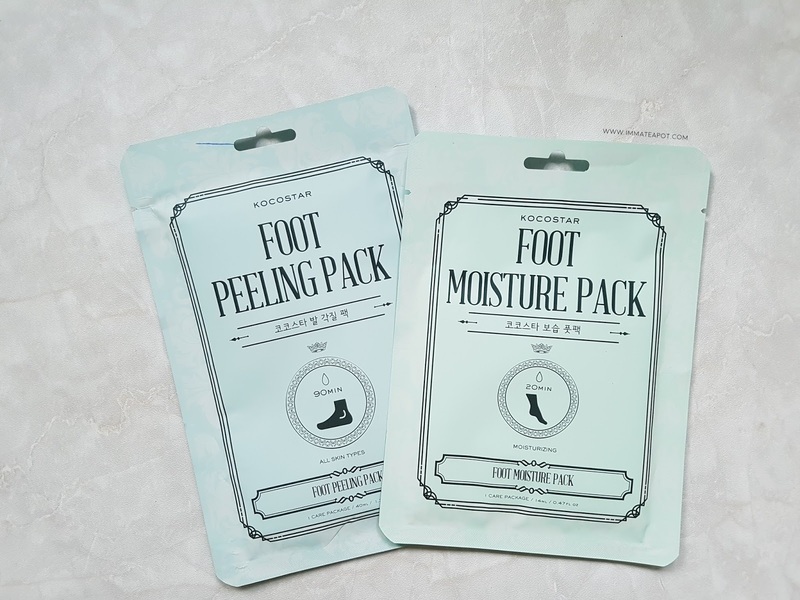 Foot Moisture Pack: Moisture and sooth dehydrated feet. Foot Peeling Pack: Exfoliate and repair stressed feet, leaving the skin smooth and soft. The Kocostar range gives you the best and quality home care treatments, definitely cheaper than paying a trip to the beauty salons. For more information, please feel free to check out Kocostar in Sephora stores nationwide. Kindda pricey, but im excited that its now available in Sephora. Time to checkout the variety. so cute and so many to choose from. Good gift ideas for loved ones, important to care for feet too. These look good and there are so many types. I think I need the foot moisturizer and hair care series. Wow, Kocostar really have us taken care of from hair to toes. I am interested in the Foot Peeling Pack. Whatt? Its already here? Gonna check out Sephora tomorrow. I've been waiting to try the fruit mask since forever. woo hoo.. time to go get my hair packs and all from Sephora... kocostar is to die for..
Ahhh! Facial masks. I really love this products! There are so many range of mask usage from Kocostar! My first time knowing about it! the packaging design of the care series look really nice. Interested in the hand nail care series. This is a good brand. I would love get my hands on that mask. Wow I love all these mask, will check it out.